Melasma is unwanted pigmentation on the skin that develops as a result of pregnancy, birth control pills in conjunction with sun exposure and most commonly seen in women. Many women develop this condition during the hormonal changes of pregnancy; therefore it is sometimes referred to as the mask of pregnancy. The ideal approach to this condition is a combination of laser therapy, sun protection and topical bleaching agents. At the Laser & Skin Surgery Center of New York, our laser treatment options include the Clear + Brilliant Permea, LaseMD, Fraxel Re:store Dual, nd:YAG, and the PicoSure lasers among others. We often combine our laser treatments with topical and/or oral administration of tranexamic acid. With melasma, a cure is not possible, so we strive to achieve as much sustained lightening as possible with our combination regimen. The various options will be discussed at your consultation. For many patients, treatment can begin at the time of consultation. To discuss the best treatment options for your melasma, please call us to make an appointment today. At a meeting sponsored by SkinCare Physicians and Northwestern University, Dr. Roy G. Geronemus discussed his experience treating patients with the FDA-cleared technology, which is known as the Clear + Brilliant Permea. Drs. 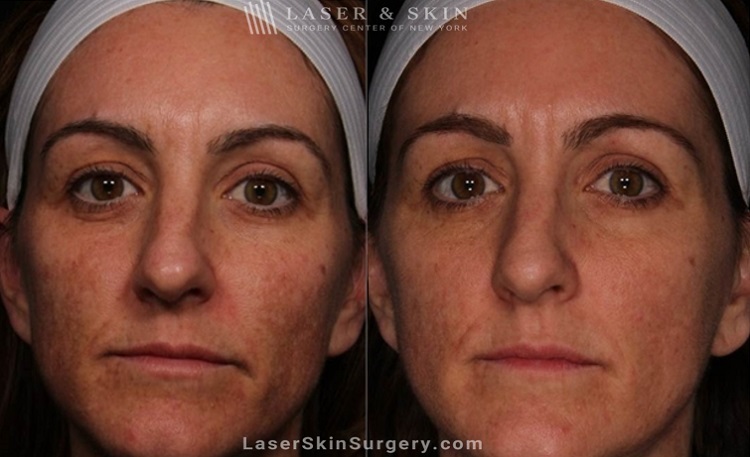 Geronemus and Brauer present cutting edge research on the treatment of melasma using the Clear + Brilliant Permea at the 2013 Annual Conference of the American Society for Laser Medicine and Surgery.